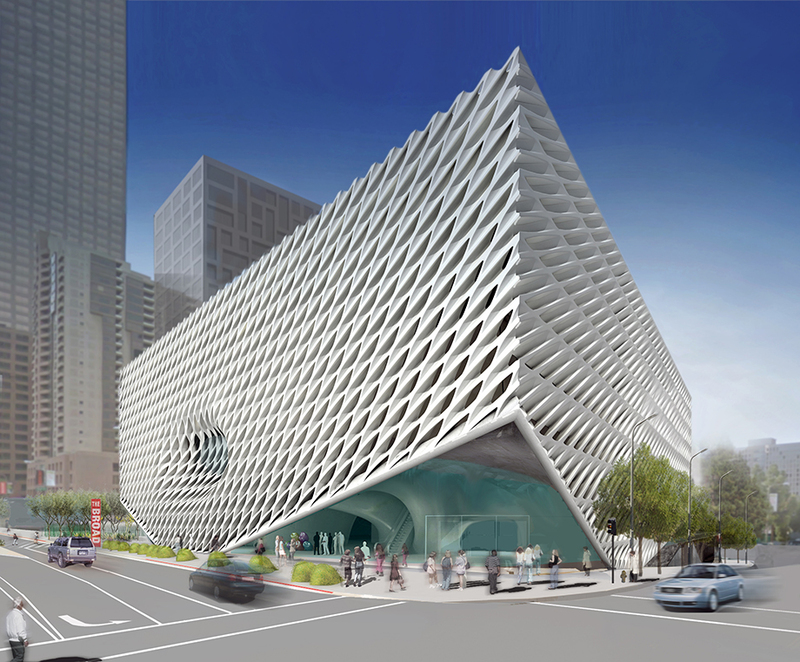 The Broad is being constructed on Grand Avenue in downtown Los Angeles. It will be across from MOCA and adjacent to the Frank Gehry-designed Walt Disney Concert Hall, essentially at the center of the Grand Avenue Project, which Eli Broad co-founded to develop a cultural center around downtown’s Bunker Hill and Civic Center. The three-story, 120,000-square-foot building is expected to achieve LEED Silver certification and is being constructed at a cost of $140 million. The Broad was designed by Diller Scofidio + Renfro with an innovative “veil and vault” program to connect, conceptually and physically, outward public exhibition spaces with interior archive and work spaces. The exterior of the building will feature a honeycomb-like veil which will function as a brise-soleil to filter daylight into the building. The interior core of the building will contain the vault, with spaces for art storage, museum offices, and a lecture hall. The veil will be constructed of steel and glass-fiber-reinforced concrete by the German firm Seele. The vault is being constructed on site with some 36 million pounds of concrete. At the street-level, the veil lifts at one corner to provide entrance from Grand Avenue into the public lobby, a shop, a multimedia space, and a 105-foot escalator that ascends directly to the third floor. The second floor will contain the vault. Its underside will shape the ceiling of the lobby below, its roof will be the floor of the third floor gallery, and its interior will be interrupted by the escalator, providing interior views as visitors ascend through the core of building. 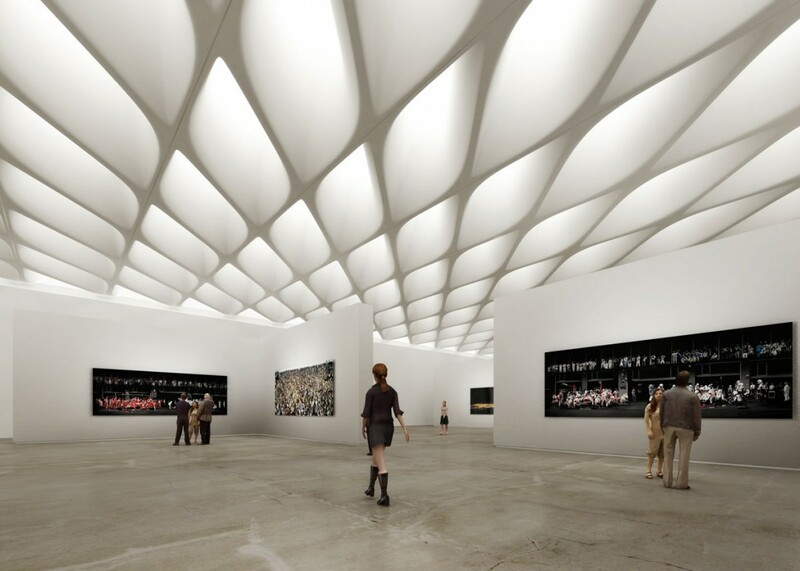 The third floor will be skylit and column-free, providing an astonishing 35,000 square feet of uninterrupted gallery space. The Broad will activate an adjacent plaza, also designed by Diller Scofidio + Renfro, to extend the public space with an open landscaped corridor from Grand Avenue to a future Metro station near 2nd Street. 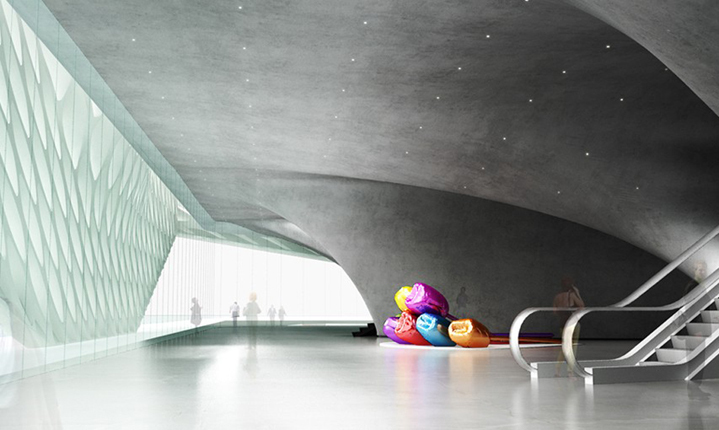 The museum is set to open in 2015 and will provide free admission. - The Broad Art Museum at the University of Michigan was designed by Zaha Hadid. - Diller Scofidio + Renfro also designed the High Line in Manhattan, the Institute of Contemporary Art in Boston, and the new Berkeley Art Museum and Pacific Film Archive.